Today’s Koala Class was so much fun! It was the last lesson of the first term before summer vacation. The children did such a good job from start to finish today. First, we had play time and then our morning meeting. 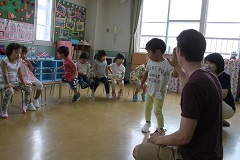 The children were able to play nicely and sing the morning meeting songs all by themselves. Each child has done great and I can see they are getting used to being by themselves. After we finished getting stickers for our sticker books, mothers joined in for the English lesson. We danced and the children made paper “ice cream cones”. Everyone could remember and say colors like “red”, “blue”, and “yellow”. Since today was our final lesson of the term, it was a review and all the children could show what they remember. I am so pleased with the Koala Class children and look forward to lessons (and lunch together) in the secon term. GOOD JOB everyone and thank you for such a great start!